About a week ago, while I was scoping Winter's Pond (a large pond in Langford), I watched a lone swan fly in and settle out on the ice. Swans are so large, they quickly catch your attention! The bird seemed quite large, indeed, and upon closer inspection in my scope, I noticed it didn't have any yellow at the lores (the area between the eye and bill). 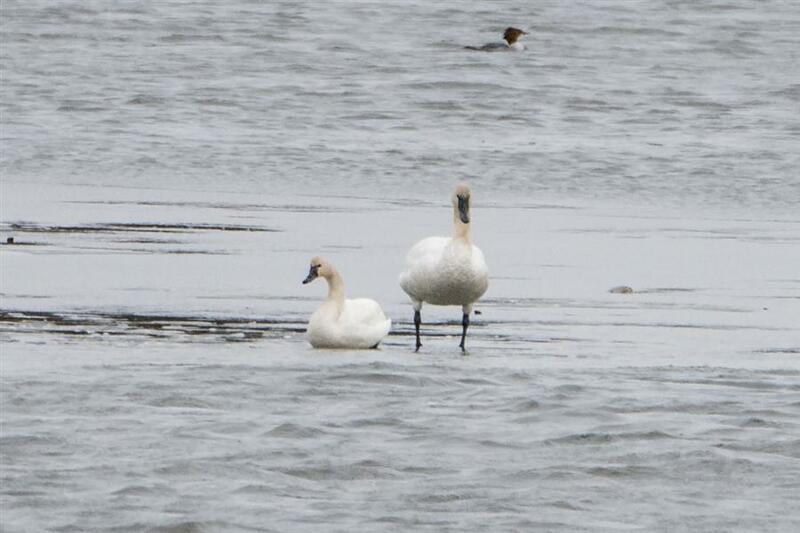 Right away, I began to suspect this might not be the normally expected Tundra Swan, but perhaps the more rare Trumpeter Swan. This swan's bill seemed very large and straight, giving me more cause to think "Trumpeter". I began taking photos, hoping that later on I might get some more experienced birders' input on the ID of this guy. Not having a Tundra Swan to compare it to for size and other field marks made this a little tricky and something I'd like some assistance with. 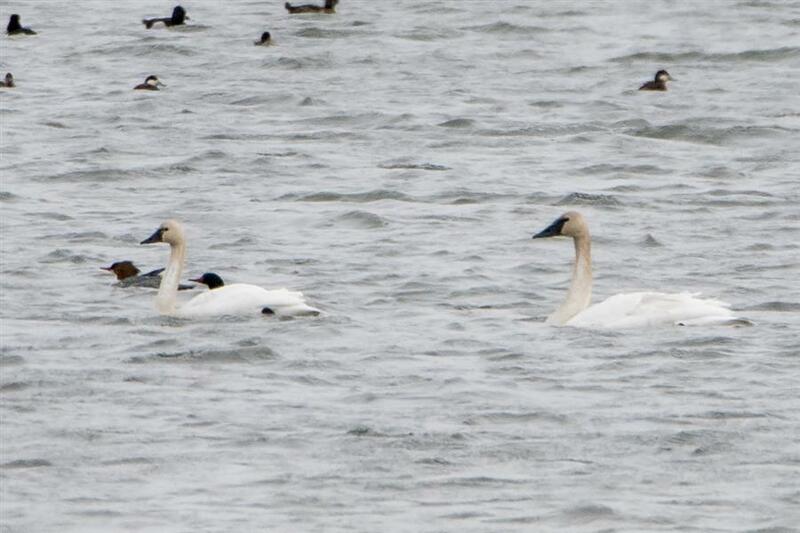 In Western New York, Tundra Swans are much more common. They usually have yellow lores and a smaller bill that dips in the middle. Their head shape is more round and the black area above the bill curves like a "U". Trumpeters, on the other hand, have that black area shaped more like a "V", the slope of the crown of their head matches the straight slope of their bill, they are larger than a Tundra, they don't have any yellow at the lores, and the black skin by the eyes encompasses more of the area by the eyes. Everyone I sent my photos to agreed that the swan appeared to be a Trumpeter but I still felt a little unsettled about it. Luckily, a few days later, the swan was joined by a Tundra - this certainly made the identification much easier! The two swans hung out together giving me great direct comparisons. The size differences, head shapes, bill sizes and shapes - all were so easy to discern when side-by-side. My bird was definitely a Trumpeter. Unfortunately, though, I never got to hear the Trumpeter call. Apparently, it's named for its trumpet-like sound, which would have been very neat to hear - and hearing it sure would have made its identification easier on that first day! 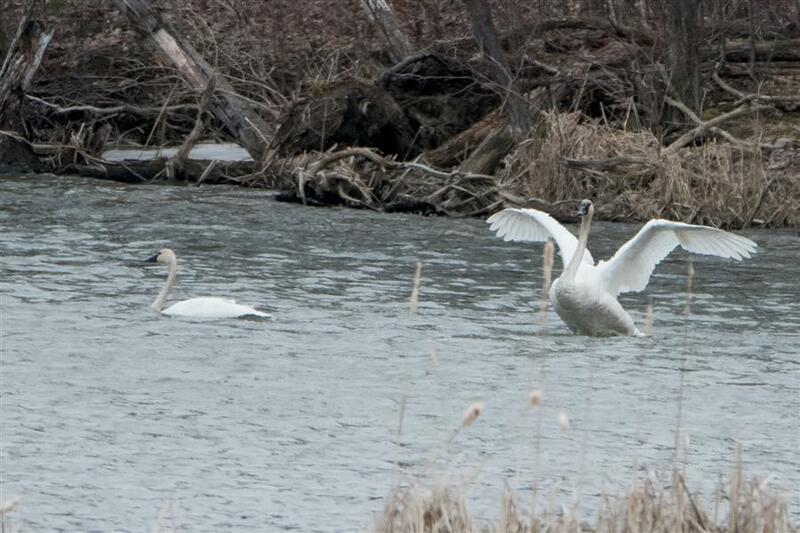 There is a reintroduction program for the Trumpeter Swan in Ontario. Every now and then, we'll see one of these large swans with a big wing tag come through the region. If this bird had been tagged, it would have made things much easier too! 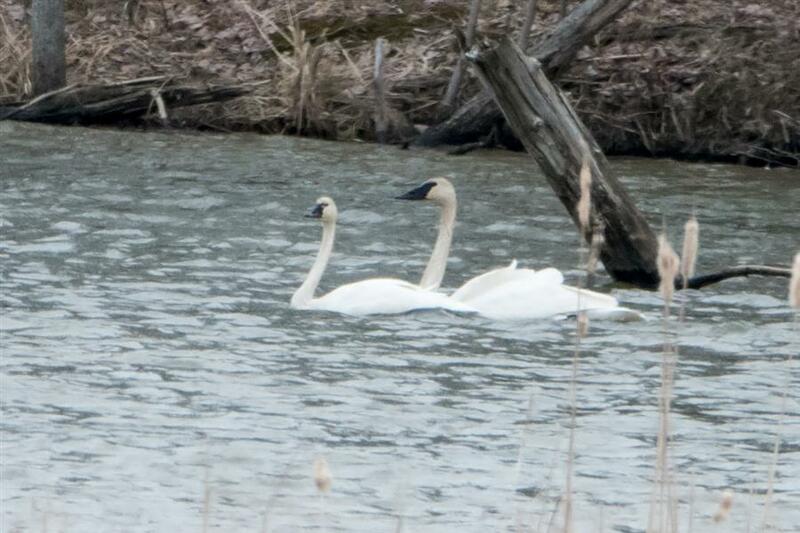 And though the Trumpeter Swan is not often seen here in Western New York, there is a small breeding population that seems to have settled in at Cayuga Pool at the Iroquois National Wildlife Refuge, which is less than an hour from here. You can usually find them up on Lake Ontario near the Rochester area each winter as well. So even though the Trumpeter may be uncommon here, we do get to see them regularly. BUT - it's the first one I've found on my own, so he was rather special to me! 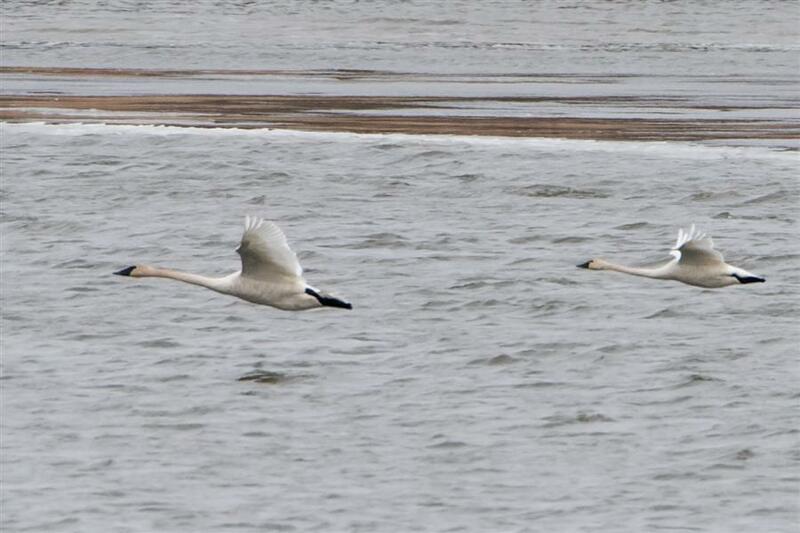 Both swans were still there today and the last photos shows them still palling around together. What a good study for me; I learned a whole lot! I hope I didn't bore you with all the details but it was such a neat lesson I just had to share! The Trumpeter gave me a little show by spreading his wings! 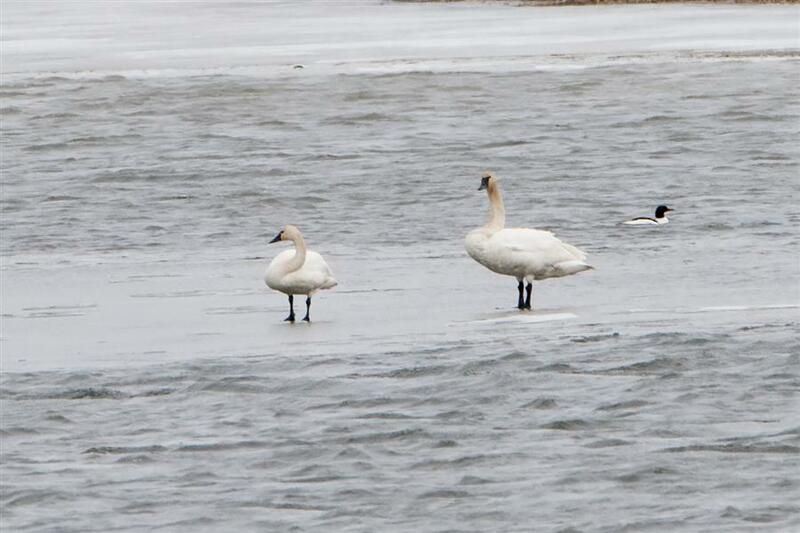 Even the thickness of the legs of the Trumpeter Swan (right) is so much heavier than the Tundra's. 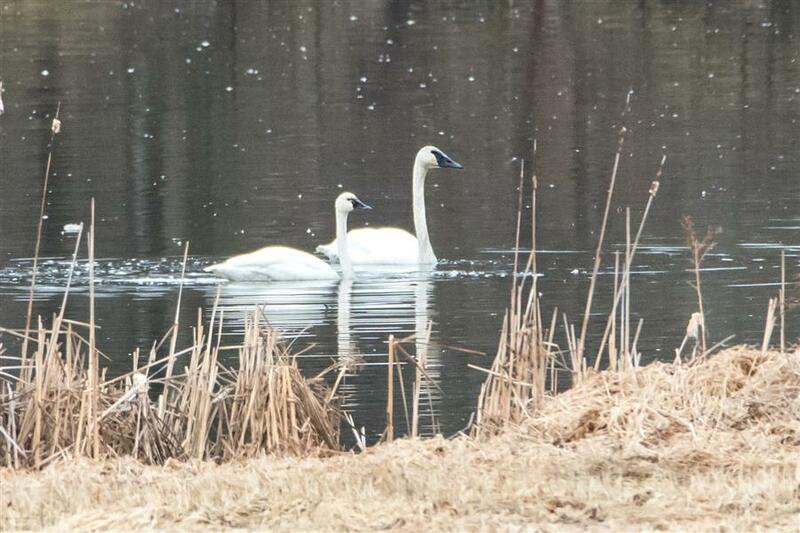 Both swans flying to a different spot on the pond.